A 32-yr-old female presented with a 1-mo history of fatigue, intermittent fevers, and dyspnea on exertion. One day before her doctor's appointment, she noted transient monocular blindness that resolved within 1 h. On physical exam, she had both a holosystolic apical and late diastolic positional rumble, diminished S1, and an end-diastolic "plopping" sound heard in late systole. She was sent for an echocardiogram to rule out cardiac source of embolus (Fig. 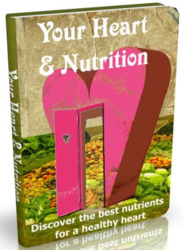 1; please see companion DVD for corresponding video). She subsequently underwent cardiac surgery and a left atrial tumor was excised and confirmed to be a myxoma on pathological examination. Masses in or around the heart are most often incidental findings on echocardiography. Less frequently, a tumor involving the heart causes direct symptoms that lead the clinician to suspect a cardiac abnormality. True intracardiac or extracardiac masses need to be distinguished from the entities in the following section. to the fossa ovalis. 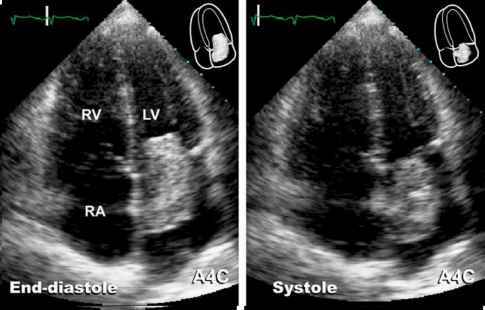 It can remain prominent in adults, where it appears as a transverse linear echo running approximately parallel to the tricuspid annulus across the posterior right atrium in right ventricular inflow views, or in subcostal views (Figs. 2 and 3; please see companion DVD for corresponding video for Fig. 2). The Chiari network is similarly an embryonic remnant of the sinus venosus, which extends from and is continuous with the Eustachian valve. 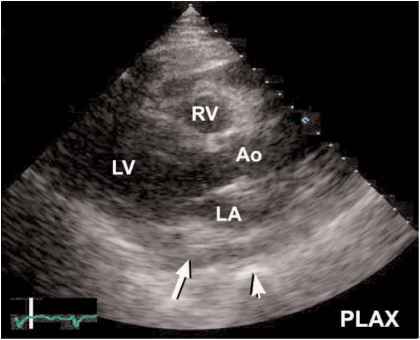 It persists in 2-3% of normal adults (confirmed by autopsy), and appears on ultrasound as a lacy weblike or fenestrated membranous echogenic mass with a characteristic chaotic, undulating motion independent from that of the tricuspid valve and right heart (Fig. 4). On parasternal long- or short-axis views, bulging of the interatrial septum into the right atrium, owing to an interatrial septal aneurysm or left atrial volume overload, can be mistaken for a "tumor" when the scanning plane cuts tangentially across the septum. Careful inspection of both atria from all windows should clarify this misdiagnosis.